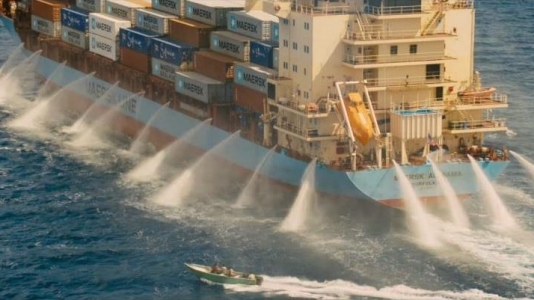 Tom Hanks is the captain of a very large container ship, the Maersk Alabama. The ship is hijacked by some pirates. The crew fends off the pirates for a while and (without giving too much away) manage to drive the pirates off the ship. BUT, as they leave, they take captain Phillips with them. I immediately went home and did a little bit of background research on the events surrounding the hijacking of the Maersk Alabama, and to my surprise, they were surprisingly accurate. Right down to some of the very small details. I was impressed. Films which are based on true stories which actually stick very closely to those stories are very rare, and for this reason alone, everyone should watch this film. The film itself is fun. Tom Hanks, as you expect, is very good, but the stand out performance comes from Barkhad Abdi, who has been nominated for best supporting actor and should easily win it, based on this performance. What is perhaps more extraordinary is that this is his first film! He has no acting experience or aspirations of any kind, and was working as a chauffeur when he was cast in this film, opposite the great Tom Hanks. Kudos to the casting director for getting a Somalian to actually play the part of a Somalian. The film sensitively portrays not only the fear and anxiety that comes with working on a container ship as it’s being hijacked (which we can all probably relate to), it also gives us some insight into the world and motivations of the pirates – something I wasn’t expecting. The first half of the film deals with the hijacking of the container ship, and how the crew use their training and cleverness to overcome the armed pirates. The film makers could have ended the film there, or compressed the second half somewhat, but instead they chose to divide the film into two distinct mini-films. In the first half, you follow Richard Philips as he leads his crew to a triumph over the pirates. In the second half, you follow Muse, the leader of the pirates, as his hostage situation gets worse and worse. By the end of the film, you are indeed a little bit sympathetic to his character, and sympathy with ‘the bad guy’ is a hallmark of great storytelling. I don’t think it will win best picture, but I think it may pick up one of the best editing, sound editing, or sound mixing prizes. I also think it would be criminal for Abdi not to win the award for best supporting actor, because regardless of the fact that this is his first film, his performance is simply brilliant.